The cast of Life Without Soul appears in Motography, a silent-era movie magazine. William A. Cohill played the Frawley/Frankenstein character, Lucy Cotton was Elizabeth and Percy Standing was “The Creation”. Cohill’s film career was brief and unremarkable. He appeared in some 30 films, mostly shorts, between 1914 and 1919. He passed away in 1931, age 48. Lucy Cotton was a popular performer on Broadway before transitioning to film in 1910. She would make only a dozen pictures over the next ten years, her acting career vastly overshadowed by her flashy socialite life. She married a press magnate in 1924, inheriting a sizeable fortune when hubby passed away two years later. Four more high-profile marriages followed, the last one in 1941 to a Russian Prince. From then on, even after their separation, Cotton called herself Princess Eristavi-Tchitcherine and expected to be addressed as “Princess” or “Your Royal Highness”. She lived alone and lavishly in a palatial Miami home she named after herself, Villa Lucia. Tragically, in late 1948, she fell ill and died from a drug overdose. Scandal sheets called her the “Showgirl-to-Princess Sleeping Pill Victim”, publishing photos of Cotton in sumptuous gowns and furs, and her estranged husband in traditional Russian garb and sword. A highly respected actor, British-born Percy Standing, billed here as Percy Darrell Standing, came from a very prominent theatrical family that included his father, three brothers, and assorted relatives down to this day. Most of his films, over 40 in all, were made in America. 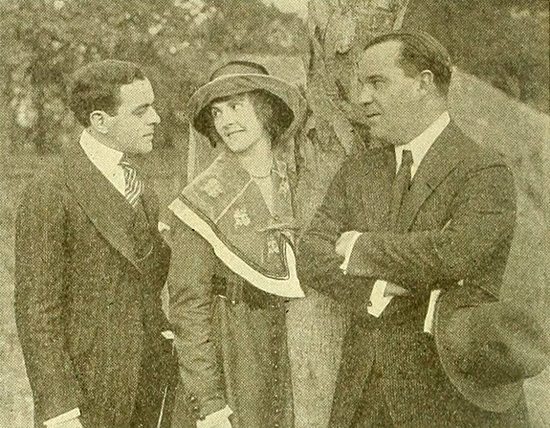 Parts included a turn as Professor Moriarty to Ellie Norwood’s Sherlock Holmes in The Final Problem (1923), and an appearance in Harmony Heaven (1930), the first British “all-talkie” color film. Standing passed away in California, in 1950, age 67. For all its promise, Ocean Film made only two more features, The Fortunate Youth and Driftwood, both in 1916. 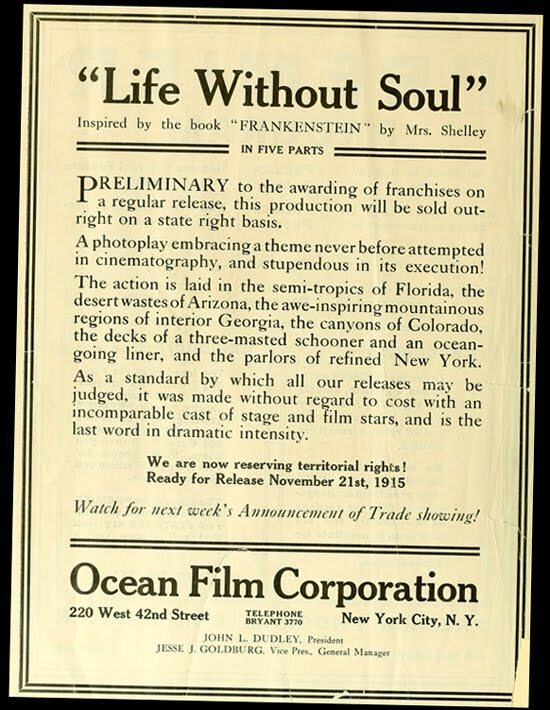 That same year, Life Without Soul was re-released through the Raver Film Corporation with added color tints and tacked-on documentary footage on how fish reproduce. In time, Life Without Soul was lost to us, but not before resurfacing one last time, 15 years on, when the most famous of all Frankenstein films was first released. That story is coming up next! Next up: It’s Percy Standing vs Boris Karloff as Silent Frankenstein Week continues! With thanks to Joe Thompson. I just learned more about LIFE WITHOUT SOUL in the couple of minutes spent reading your post than I had in my previous half a century of genre reading. I can't thank you enough for this fascinating look at a sadly lost film. Another fascinating article, especially the details about the cast. Thank you for doing this. Thank you so much, guys. I love digging up this stuff. And thank you, Joe, for your initial research that got me going on this. One more LIFE WITHOUT SOUL post coming right up, and then we move on to IL MOSTRO!